Sky-high hotel rates mean that your next vacation will likely take a big bite out of your budget. However, there are ways to find the best deals so you can lower travel costs and save money. Click through for hotel secrets to save money on your next stay. Knowing the best time to book your hotel room can help minimize travel costs. Boutique hotel booking website Stayful found that you can get the best hotel prices by booking 30 days before your stay, said Cheryl Rosner, co-founder and CEO of Stayful. However, if you don’t remember to reserve a room a full month in advance, there is another window of opportunity to score a deal. Rosner said hotels also offer great rates seven to 10 days before a stay. If you can handle waiting until the last minute, you’ll often find a great rate at a hotel by booking closer to your stay. "Book last minute," said Geena Marcelia, travel editor for Hotwire. "Although it’s common practice to book in advance, if it’s possible to wait, you can usually find the best rates one week before your travel dates." If you don’t want to chance ending up without a place to stay, you can reserve a room in advance and still take advantage of price drops by booking through Tingo.com. Tingo will automatically re-book your room at a lower rate if the price drops and refund you the difference. Timing a hotel stay right can save you money. And Sundays "are almost always the cheapest day of the week for hotels," said Marcelia. “Go to touristy areas in mid-week, when the tourists aren't there in droves,” he said. You can save money on a hotel by staying in a city’s business district on weekends, when business travelers have checked out and headed home, Tupper said. For example, he found a room in an upscale business district of Zurich, Switzerland, on a weekend at half the price of a weekday stay. Shoulder season is the period of time between the off-peak season — when the weather is not ideal for travel — and the peak season, when ideal weather conditions make prices high and crowds abundant. Because demand is lower, hotel rates tend to be as well. Just because a destination has a reputation for extreme heat, cold or storms at certain times of the year, that doesn’t mean you’re destined to experience bad weather if you visit then, said Elizabeth Avery, founder of Solo Trekker 4 U, a site dedicated to traveling alone. What you will get, though, are deep discounts on lodging, because demand will be lower in the off-season. For example, locales known for having a rainy season can be a good value, because the rains are often brief rather than continuous, she said. You can still do plenty of siteseeing — at a lower cost. If you stay on the outskirts of mid-sized and larger cities, you’ll find more upscale hotels at lower prices, said Neil Emerson, president of business development for travel brokerage company Tourico Holidays. Plus, the cost of parking will be much more reasonable — or even free — if you stay at a hotel in the suburbs rather than the city center. Before you book a trip, make sure there are no major events happening in the city when you want to visit it, said Eric Grayson, founder of Discover 7 Travel. Otherwise, you could pay astronomical rates because of an increased demand for rooms in the area, he said. Check the city’s tourism or chamber of commerce site for a calendar of events to ensure you’re not planning a trip at a time when rooms will be scarce and prices will be high. The more flexible you are with the dates you can travel, the more you can save on a hotel room. Brian Ek of Priceline recommends choosing a destination and then pricing the cost of a hotel over a few different weeks or months to spot the best rates. You can use the Trivago.com Hotel Price Index to see the average monthly prices for 35 of North America’s most popular cities and determine the cheapest time to book a stay. You can save even more on the cost of a hotel room if you’re willing to be flexible with your destination, Ek said. “Same sand, same water, same sun — only difference is the rate,” he said. Travelers often can get special deals on hotels by booking through travel apps, Ek said. For example, the Priceline app has "Tonight Only" deals that offer savings of up to 60 percent on last-minute hotel rooms, he said. Emerson of Tourico Holidays recommends the Last Minute Travel app, which offers discounts of up to 60 percent. You also can get $25 off your first hotel booking through the app. You can save money on hotel rooms by taking advantage of other people’s canceled traveled plans. The Roomer website and mobile app let you book discounted rooms that travelers have reserved but can’t use. Or, if you’ve reserved a non-refundable room but have to cancel your trip, you can get some of your money back using this service. Roomer recommends that sellers offer at least a 20 percent discount on the market price. You can get discounts of up to 60 percent if you take advantage of the option to book a room and pay online without knowing the exact hotel where you’ll be staying at sites such as Hotwire and Priceline. With Hotwire’s “Hot Rate” hotels, you’ll see a rate — and how much of a discount it is below published prices — along with the general location, hotel details and reviews. With Priceline’s “Name Your Own Price” option, you can specify your preferred neighborhood and minimum hotel star class. 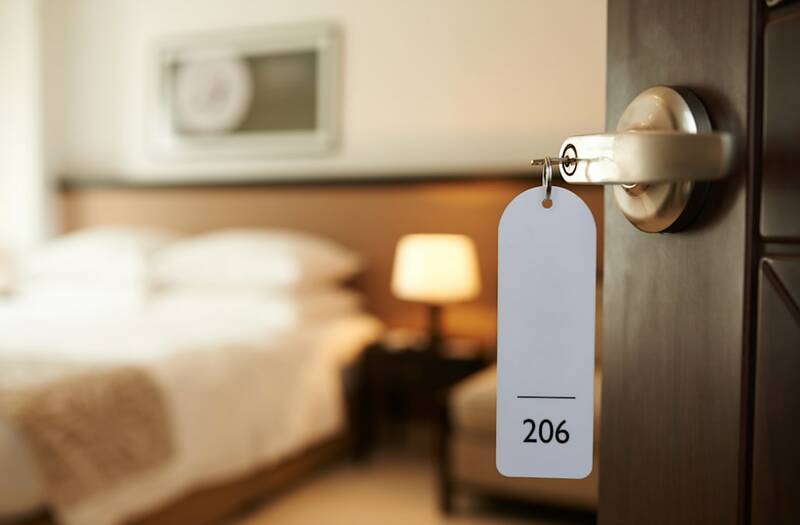 Ek recommends seeing what the published rates are for hotels in the neighborhood and then entering a bid that’s 60 percent below the going rate. And with Priceline’s “Express Deals,” you can pick the exact amenities you want — such as number of beds — in addition to star rating and location. There are plenty of coupon websites that offer codes to save money on purchases with online retailers. But coupon codes aren’t just for products. "By using online coupons for travel, people can expect to save up to 20 percent,” said Scott Kluth, founder of CouponCabin, a site that offers both coupon codes and cash back on purchases at certain retailers. The benefit of using coupons is that you can stack them with other discounts and cash-back offers to maximize your savings, Kluth said. You can save up to hundreds of dollars by taking advantage of deals offered by travel sites that bundle airfare and hotel accommodations into one price, said Ek. These package deals allow hotels to offer lower rates because the room price isn’t disclosed separately from airfare, he said. “It gives a hotel cover for selling at a lower rate,” Ek said. If you prefer staying at independent or boutique hotels, you can cut the cost of a room using a site such as Stayful. With Stayful, you can bid on hotel rooms in more than 30 markets — much like you would with Priceline’s “Name Your Price” option — but the name of the hotel is revealed from the start. “Even if the customer’s offer is too low for the hotel, they will come back with a price they would be willing to accept,” Rosner said. Travelers save an average of 22 percent using the site’s bidding process. Most of the major hotel chains such as Hilton, Hyatt and Marriott have loyalty programs where you can earn points for staying at their properties and cash in those points for free stays. Programs also offer benefits like discounted room rates, room upgrades and free internet access. Some travel booking sites have their own rewards programs that members can join for free and earn points for free stays at a variety of hotels. For example, the Orbitz.com Orbitz Rewards program lets you earn 1 Orbuck for every $1 spent on eligible hotel bookings. Hotels.com also offers a rewards program that’s free to join and allows members to get a free hotel stay after booking 10 stays through the site. Major hotel chains aren’t the only ones that reward their guests for being loyal. You can get free stays at independent hotels through Stash Hotel Rewards. This free program lets you earn points by booking through StashRewards.com and redeem them for rooms at more than 150 hotels in 100 cities. International travelers can join Voilà Hotel Rewards at VHR.com to earn points for free stays at independent hotels and resorts around the world. Members also get other benefits, including early check-in, late check-out and room upgrades. You can rack up points for free hotel stays even faster if you get a hotel-branded credit card. With the Hilton HHonors Card from American Express, for example, you can earn seven points for every dollar you spend on Hilton properties, five points for every dollar spent on gas, grocery and restaurant purchases, and three points per dollar for all other purchases. There’s no annual fee, and you can get 80,000 bonus points if you spend $2,000 in the first three months after getting your card. Even if you don’t have a hotel-branded credit card, your credit card might offer savings and perks at hotels. For example, American Express Platinum cardholders can book through Amex Travel’s Fine Hotels & Resorts service for benefits such as room upgrades, free internet, food and beverage credits and more. Check your card to see what travel benefits it offers. You can get a lot more value for your hotel dollar by using a travel booking site that gives you airline miles when you book through them, said Jared Blank, CMO of deal and coupon site DealNews.com. Rocketmiles.com, Pointshound.com and Kaligo.com are three sites that offer up thousands of miles per night for your favorite airline frequent flyer program when you book through them. And room rates are generally the same as those found on other travel sites, he said. Several hotels offer guests free food, so you can eliminate the cost of some meals if you stay at these chains. Comfort Inn & Suites and Hampton Hotels, for example, offer guests free, hot breakfast. Embassy Suites offers guests complimentary breakfasts and free drinks in the evening. And kids younger than 12 can eat free at Holiday Inn on-site restaurants. Also, ask the hotel staff about whether it has deals with nearby restaurants that will give you a discount for being a guest at that hotel. When you check into a hotel, treat the staff well to get better treatment. Being nice to hotel employees might get you a room upgrade or other perk at no extra charge. In addition to being polite, Avery of Solo Trekker 4 U said that if you're staying at a hotel in a foreign country, try speaking to the hotel staff in the local language. When she was in the Middle East, for example, she spoke in Arabic during check-in and was upgraded to a suite — for free. Resort fees are extra charges hotels levy for amenities such as the use of gym facilities or pool towels. Ek of Priceline said that travel sites are required to disclose the additional fees that hotels and resorts charge. But sometimes this information is limited, because it’s based on what the properties disclose to the third-party sites. If these charges show up on your bill and you weren’t aware that you were going to be hit with them — or if you’re charged for amenities you didn’t use — ask to have the resort fees removed. Just remember to be polite about it. If your hotel doesn't offer free WiFi, you might be able to get free access if you join the hotel’s loyalty program — which should be free. Or, if you have an ample data plan for your smartphone, you can use your phone as a mobile hotspot to connect to the internet. Check your phone’s settings for the personal hotspot option. Some hotels in metropolitan areas charge outrageous parking fees. You might be able to find cheaper parking at a nearby parking garage or lot — and there might be coupons that let you save more. Find out what time you can check in at the hotel you’ve booked before you arrive by calling or looking online. Otherwise, if you show up before the designated check-in time, you could be charged a fee. Before you leave money in an envelope for the person who cleans your room, ask whether a housekeeping gratuity is automatically included in your bill, so you don’t spend more on tipping than necessary. Resorts, in particular, are prone to adding this charge. You pay a high price for the convenience of room service. Not only will you be charged a room service fee and a gratuity, but you’ll also be expected to tip the person who brings the food to your room. If you’re too tired to venture out to a restaurant, ask the hotel staff which restaurants in the area deliver to the hotel for free and whether they have menus for them. Or, check local restaurants’ sites to find out which ones offer the best prices. If you ask the hotel staff to hold your bags in storage to avoid checking out late, you might get hit with a fee. To be safe, ask about any fees before handing over your luggage. Most hotel rates are based on double occupancy. So, if you have more than two people in a room — even kids — you might have to pay more. Always check a hotel’s policy before you book, and avoid properties that charge extra if there are more than two people in your party. Take advantage or your profession or membership in various groups to score hotel discounts. For example, hotel chains such as Choice Hotels, Hilton and Marriott all offer discounted rates for military members and government employees. AARP, the organization for adults 50 and older, offers its members discounts that typically range from 5 percent to 20 percent at several hotels. And AAA members can score discounts of up to 15 percent. It’s easy to compare prices and book hotel stays online. But you might get a room with more perks at no extra cost if you use a travel agent to book your stay. That’s because travel agents can leverage their relationships with hotels to get more for guests, said Jenny Ingram of Blue Grotto Travel, a travel agency in Fort Worth, Texas. Ingram said she once scored a bottle of rum, a room upgrade, spa credit, early check-in and late checkout for clients who were staying at a hotel in Jamaica. And the room rate was the same as what they would’ve found on a discount travel site. Getting a room with a view of the beach or city skyline can cost you more. If you’re only going to be in your room after dark, don’t pay extra for a view you won’t be able to enjoy, said Avery. If you find a hotel deal that seems too good to be true, it probably is, Avery said. A hotel with an unbelievably low rate might have lots of hidden costs that could wipe out any savings you think you’re getting. Moreover, quality issues might be the reason a hotel’s price is below the going rate — and a good reason to stay away, said Avery. If you check for hotel rates and can’t find any that fit your budget, don’t give up. Hotels frequently adjust their rates, Ek said. To keep track of hotel rates, you can sign up for price alerts at the travel aggregator site, Kayak.com. You’ll be notified by a text message or email when rates at hotels you select change. Setting price alerts can help you nab hotel deals without having to check back at hotel or travel sites daily. "When traveling through Southeast Asia, you can save up to 50 percent on hotels just by booking your room in person and paying with cash," said Max Chambers and Loren Rispoli, who run the travel website Infinite Saturdays. "Sites like Agoda, Booking.com and Hostelworld are great for the U.S. or Europe, but don't provide competitive rates in a number of Southeast Asian countries." Said Chambers, "Recently, in Cebu in the Philippines, we found the price of one hotel on Agoda quoted at $35, but when turning up at the hotel, they were charging $25 for the exact same room." If talking to the front desk or hotel staff doesn't get you hotel perks, talk to the big boss. "Another tip to get cheap hotels in [South Asia] is to bargain with the hotel owners," said Chambers. "Not only can you get a reduced price on your room, you can get things like breakfast or meal vouchers included in your stay." "The best way to find last-minute deals is through mobile websites, mobile apps and by calling in," said Mahesh Chaddah, co-founder of hotel booking site Reservations.com. "Many hotels will offer limited discount rates to mobile users only, so keep those apps handy." "We have all heard of the old saying, 'What you see is what you get,' but sometimes you want what you don't see," said Chaddah. "Almost all hotels publish the same room rates on all public websites. However, most also offer discount hidden rates up to 30 percent cheaper through unpublished channels, like the call center." If you haven't signed up to be a registered user on your favorite travel booking site, you should do so before you plan your next trip. "Most websites offer limited special rates, flash rates and extra room availability on sold-out hotels to their registered and logged-in users," said Chaddah. "So, make sure you sign up and sign in before searching." Don't wait until the weekend to book your hotel — do it on a Tuesday. "Based on historical data, hotel booking rates are the lowest on this day of the week," said Chaddah. "So, be sure to compare prices and take advantage of the lower rates being offered on this day." If you're planning a vacation in your state, you might be eligible to score a discount on your hotel stay. "Many hotels — for instance, those in Florida and Hawaii — offer state resident discounts," said Chaddah. "All you need is a state-issued ID at check-in, and you can save an extra 10 percent to 20 percent. So, next time you take a staycation or local getaway, make sure you show off that driver’s license." "Most hotels create business partnerships with local businesses, restaurants and activities," said Jennie Jacobs, director of sales and marketing at Hotel Santa Barbara in California. "These relationships equate to great experiences, savings and deals for guests. For instance, a local restaurant partner might provide the front desk or hotel concierge with some discount coupons or maybe a free dessert with dinner, if the staff calls and books the reservation." "If you go to a booking site (i.e. Booking.com ) that has 'deals' listed, call the hotel/inn direct, tell them you have seen the rates offered on the site and were wondering if they could better it," said Pekka Paavonpera, an inkeeper at Snapdragon Inn. "Chances are they can, by between 10 and 15 percent, because that’s the commission they have to pay the booking site anyway." If you're planning a trip to Vegas, travel expert David Yeskel offers this tip on how to score the best rate on your hotel. "Travelers should register on the individual hotels’ virtual guest books," he said. "They'll receive promotional emails that often pair low room rates with free daily buffet passes and other resort credits that can bring the effective daily room rate down to ridiculously low levels."